My daughter loves this and it looks great on her bed. Not nearly as puffy as we would have liked but it's great anyway. The extra throw pillows are great as well. The fabric is soft and it's definitely bright white like the pic shows. The tufts are only about halfway down the comforter if that matters to you. Style your space with the casual elegance of Intelligent Design's Quinn Comforter Set. This beautiful white comforter and sham features elastic embroidery with pleated panels, adding dimension and charm to the bedding set. A square decorative pillow with metallic embroidery makes statement on top of the bed, while an oblong pillow with fabric manipulation provides a charming touch. Machine washable for easy care, this comforter set brings a chic look to your bedroom decor. 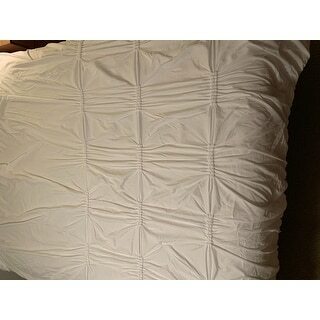 This comforter is very elegant and has a beautiful silky feel to it! It is very light and fluffy and I plan on using that in the summer time! 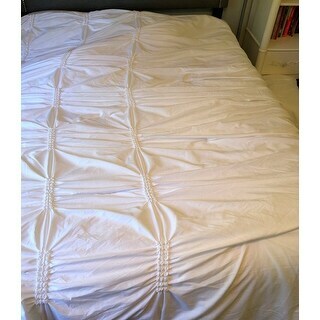 I love that it comes with matching shams and pillows and the price point was great! 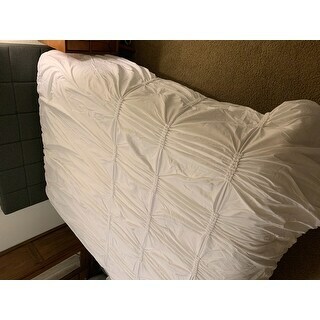 I’ve been trying to find a white plain comforter set but was unsuccessful till I found it on Wayfare I love that it comes with matching shams and pillows and the price point was great! 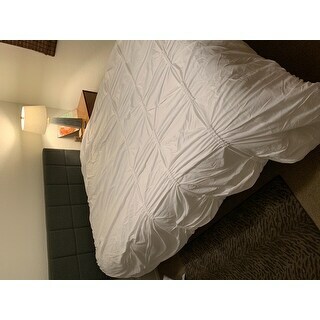 I’ve been trying to find a white thin comforter set but was unsuccessful till I found it on Overstock!! Matched this comforter with sheets that have varying shades of grey. Added two grey Euro shams and two midnight blue throw pillows and it’s gorgeous. Perfectly bright white color and looks great against our dark grey farmhouse bed. The decorative pillows are in the small side but minor thing to consider for us. I was skeptical since i purchase another set previously that looked so amazing in picture but when arrived it was a complete ugly and cheap set, so i was expecting this one to be no better (this is what we risk when buying online) . To my surprise, the set looks fabulous and it is a good quality. I receive so many compliments on this set. Happy i purchased. Very soft and comfort. Looks elegant in our newly furnished bedroom set. Beautiful, more than I expected. Wasn't sure about the elastic embroidery with pleated panels but it is well made and adds to the design. The little matching throw cushion is sweet. Not sure about the other cushion with silver but that's OK, all in all I'm very very pleased with everything. .....again, a great buy. The comforter is Beautiful and so soft!! I just love this comforter set. I bought it for my daughter's room, and it is perfect! It has a very luxurious look to it, and what a great price!!!! We are very pleased!!! looks nice give a no fuss look to our guest room like the whit on white look, i put with light gray sheets. it shipped fast but was crammed into a small box which made the set wrinkled. Love this bedding. I was redoing my teen daughters room and she wanted all white. I wasn't expecting such great quality for the price I paid but I was wrong. I would definitely purchase again. Great service and fast shipping as well. Beautiful quality. I bought this for my 13 year old daughter as she is making a teen room for herself. So elegant looking, it's exactly what she was looking for. I really like this style if, however there are only three rows of pleats. I don’t know if this is a mistake or if this is how it is supposed to be. It seems that there should be another row in order to look finished. I will contact them and find out. I chose that comforter set because of price, looks and reviews! I have been looking for a white comforter set and that matches all my criteria. I hope it looks as good in person as it looks in the pictures. Christmas gift for my daughter. The product looks as though it is light weight and the design is lovely for a girls room.